So I took an embarrassingly long break. You might have noticed. I didn’t even warn you about it, I just sheepishly snuck away. I have excuses; but excuses never sit right with me, so I’ll spare you. In the two weeks leading up to Christmas, I was juggling an insane christmas cookie baking schedule. I meant to share a favorite recipe, but didn’t want to waste the time to futz with the camera for the perfect (or even just acceptable) shots. I go a little crazy this time of year, and Mr R got his first real taste of the truth in that statement. I was out of bed at 6 to mix up dough to chill while I was at work or to bake off a couple trays of cookies prepped the night before. In the evenings, I turned on the Pandora Christmas station and got the kitchenaids whirring. The kitchen was a flurry of flour and powdered sugar, and the sink a constant pile of dishes; I stressed about finding the time to finish everyone’s favorite cookie and tried to get some new ones into the rotation. I went through an obscene amount of butter, sugar, and flour; and then I went out to get some more. By 4 pm Christmas eve, I had turned out 16 kinds of cookies, 2 beautiful loaves of Stöllen, and a vanilla pear tart. I felt like I hadn’t sat down in days. 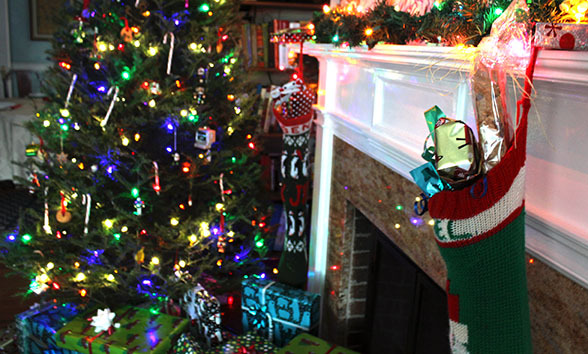 I think I finally understood why my parents always looked so exhausted on Christmas day growing up; it’s hard to juggle the holidays, the laundry, and a job! So then I was determined to end my absence here with a recipe for your new year’s parties. The kind of recipe that is so dangerous to have around the house you will only make it when you know you are having guests. For my mom, that recipe was an eclair tart. She’d mix up a batch of pate a choux and spread it into a sheet pan to bake. Once cool, she’d top it with a thick layer of vanilla pudding lightened with cool whip and finish it with a warm drizzle of melted chocolate frosting. Without fail, it was summarily whisked out the front door headed to whatever dinner party they were off to that evening while I was left to lick the leftover vanilla cream from its bowl. I thought it was some cruel form of deprival until she confessed recently to the true reason it always left the house in a hurry. No hard feelings, I understand. And that brings us to now. Now the holiday eating is over; now the new year’s resolutions have been made; now the gym is overly crowded and brothy soups and juices are in. I missed my window completely. But what to do when I don’t juice at home and spending a day taking pictures of a wheatberry salad crammed with kale and sun dried tomatoes, though probably tasty, seems tedious and boring? Yesterday afternoon a Nor’easter blew in. All of Boston was sent home early. The streets were amazingly empty as I tromped home at 5 pm and found Mr. R already safe and sound. This morning the snow is still swirling, the cars are entombed in their parking spots, and there is a constant low rumble of plows and snowblowers. Snow days are the best kind of excuse to briefly forget I still have dozens of christmas cookies to eat; the best kind of excuse to make something sweet while I watch the neighbors shovel the driveway. * Snow days are the kind of excuse that sit very right with me. If you don’t have a snow day, if you’ve resolved to hit the gym and pin all those juice and salad recipes, I’m sorry. You understand; no hard feelings. This is an unabashedly American treat akin to puppy chow (but with a salty kick) that is hard to put down. The recipe is easily adapted to your personal preference. 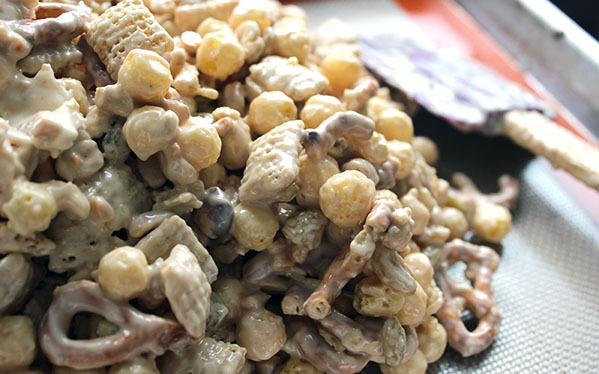 Swap in Kix instead of the peanut butter puffs, cashews instead of peanuts, leave out the raisins, etc. Just make sure to keep in the pretzels for their saltiness; and I find the rice chex lends a crispy, airy texture that is hard to get from other cereals. 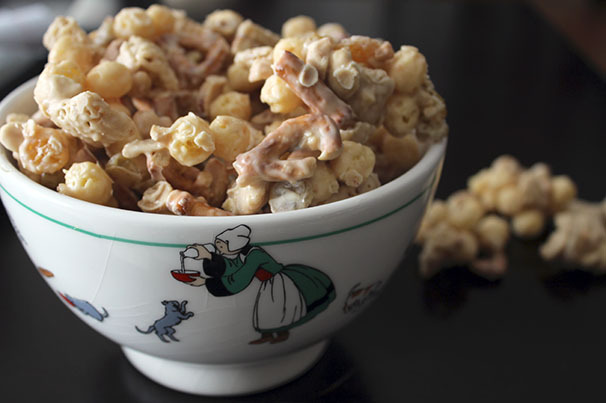 Combine the pretzels, peanuts, cereals, and raisins in a large bowl. Mix to distribute everything. Pour the white chocolate chips into a microwave safe bowl. Microwave on high for 30 second intervals, mixing the chips in between. Once ~3/4 of the chips have melted, add in the peanut butter and salt. Heat again for 30 seconds, then mix. Repeat until everything is smooth and combined (four 30 second intervals in my microwave). Don’t be tempted to heat the chips for more than 30 seconds at a time as the white chocolate is prone to burning. Pour the melted chocolate and peanut butter mixture over the cereal. Gently mix with a spatula to evenly coat. Scrape down the sides of the bowl and come up from the bottom, then turn the bowl 1/4 turn and repeat. This motion will ensure even coating without crushing the cereal to powdery bits. Pour the cereal out onto a sheet pan lined with a silpat or parchment paper, spread into an even layer and let cool. 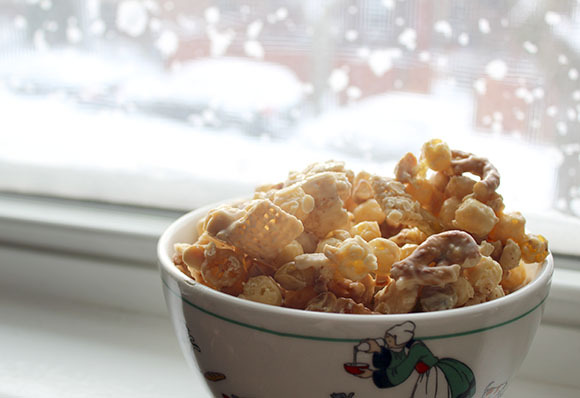 Break apart into clusters and start snacking! *To be clear, Mr. R and I shoveled the driveway for the last storm. 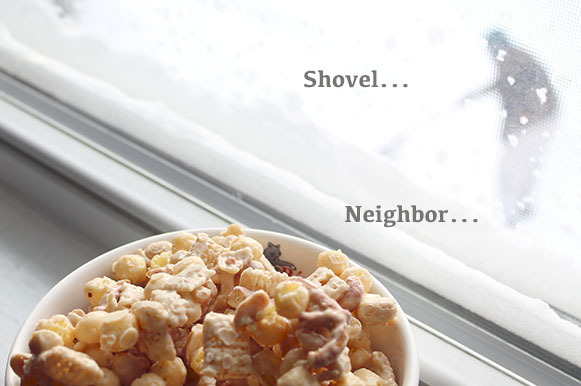 I’m not a snow-shoveling freeloader, and I pay in cookies and treats.